This is the second post in a series that places the Justice for Our Stolen Children camp in Regina into historical contexts of tipi camps and settler responses to Indigenous presence on the prairies. You can check out the first article in the series (here). The third and final article will be available next Friday. 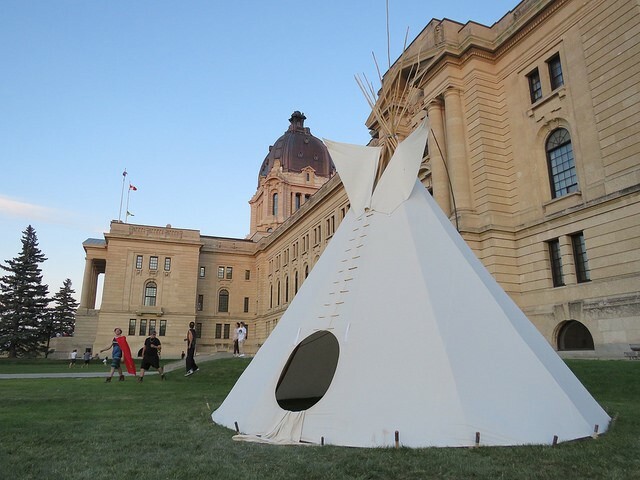 In direct contrast to the opposition to the Justice for Our Stolen Children camp, a tipi sits on display on the Saskatchewan Legislature grounds one year earlier, as part of Canada 150 celebrations. For the Indigenous people who called the plains home, encampments were central to their everyday cultural, social, spiritual, and political lives. Cultural and spiritual meanings associated with the tipi and encampments are deep and complex; this includes the elements, design, position of the tipi, their ownership, their ceremonial role, and the organization of the camp, to name just a few. Of course, the specific cultural and spiritual meaning and practices associated with tipis and encampments differ among the diverse First Nations of the plains. This article seeks to situate responses to the Justice for Our Children Camp on the grounds of the Saskatchewan Legislature within the historical context of reducing “tipi villages” to ahistorical symbols of Canada’s nationhood. This context is placed vis-a-vis Indigenous perspectives on these camps as sites of cultural, social, and political gathering apart from settler interests. For early settlers coming into contact with Indigenous plains peoples, tipi encampments were primarily remarked upon for their form and function. Although often ignorantly defined as “primitive,” it is clear that these were autonomous, self-determined, complex spaces. In the late 1860’s, HBC apprentice clerk Isaac Cowie describes a gathering of ”three hundred and fifty large leather lodges” of Cree, Saulteaux, Assiniboine, and a small group of Metis, “containing a mix population of probably two thousand five hundred or three thousand.” Cowie’s description of the camp and its purpose make it clear that these Indigenous groups had diverse and complex reasons for gathering. Among these, Cowie lists buffalo hunting, the Sundance ceremony, a gathering of the Warrior’s lodge, and military protection from the Blackfoot. Cowie notes the inhabitants of the camp had varied and divergent interests and were “very far from agreeing on other matters amongst themselves.” In other words, they were diverse cultures with diverse needs, and sought to be treated as such. 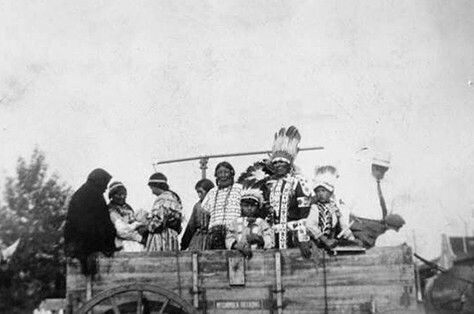 After the signing of the Numbered Treaties on the Canadian prairies, settler colonial forces tightened their grip on First Nations with the forced relocation of First Nations onto reserves. As well, increasing controls and colonial violence were perpetrated through the Indian Act with the the banning of cultural gatherings and with the pass and permit system. As colonial controls increased, so too did settler anxiety and fear associated with these encampments, as they symbolized and facilitated the mobility and autonomy of Indigenous peoples. The reactions to a gathering of approximately 3000 Indigenous peoples at Fort Walsh in the spring of 1881–which was to be one of the last gatherings of this kind–provides a stark contrast to Cowie’s account. Fear of a First Nation Confederacy prompted militarized controls on the part of Canadian officials. However, the reasons for the gathering mirrored those described by Cowie only two decades earlier. Throughout the late twentieth century and beyond, the Government of Canada acted in concert with the RCMP and others to subjugate First Nations through starvation, incarceration, and armed interference with political and cultural gatherings. Indian Agents were tasked with enforcing the illegal processes of the pass and permit systems, which required First Nations people to obtain written permission to leave the reserve or to sell goods. This colonial violence ironically coincided with requests for their participation at local fairs and festivals on the prairies, which were often arranged through the local Indian Agent. 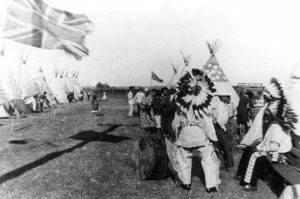 Within the Saskatchewan context, Indigenous groups performed at and attended fairs in places like Yorkton and Saskatoon throughout the early 1900s. 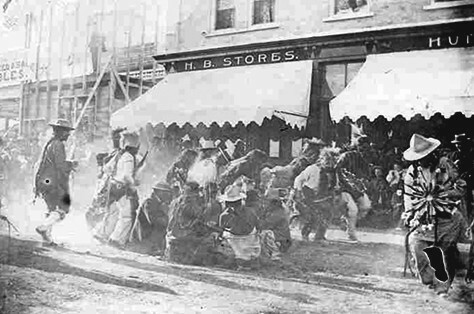 A group of unidentified First Nations people performing for settler onlookers in downtown Yorkton, SK in 1908. Provincial Archives of Saskatchewan, S-B4015. People from the Whitecap Dakota First Nation participating in the Saskatoon Exhibition parade ca. 1940. This tradition continues to this day. Photo courtesy of Melvin Littlecrow, pictured second from the right. Of course, these encounters go well beyond irony, as real violence and extreme restrictions were being perpetrated against Indigenous people both on and off reserve. These restrictions and controls were not uniquely federal actions, as the Government of Saskatchewan had its own mechanisms for colonization, including restrictions on land and treaty rights, and the mass apprehension of Indigenous children enabled through the post-1951 Indian Act amendments. 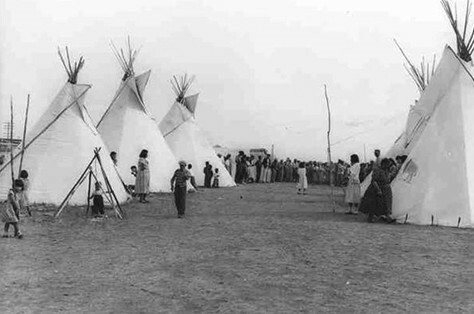 In the 1950s, many First Nations were invited to participate in Saskatchewan Western Development Museum pioneer shows meant to showcase the technological progress on the Canadian prairies by featuring threshing demonstrations, parades, and historical re-enactments, which included “Indian Villages.” As one example, people from the Whitecap Dakota First Nation participated actively in tipi villages in Saskatoon throughout the early to mid-twentieth century. This began as part of the Saskatoon Exhibition and, later, as part of Pion-Era–a late summer festival held by the Saskatoon Western Development Museum that began in 1955 to commemorate the fiftieth anniversary of the province. Part of the Pion-Era “Indian Village,” included rows of tipis with a cooking pit and tripod. A fence separates settler visitors to the village from the Indigenous participants. The woman with hands on her hips, wearing a striped dress, has been identified as Pauline Royal of the Whitecap Dakota First Nation, while Jewel Littlecrow peeks out from behind a tipi on the left. Photo courtesy of Saskatoon Public Library, Local History Room. B-5112, 1959, Hillyard Photographs Collection. Whitecap Dakota First Nation participants gather at the Pion-Era tipi village ca. 1955. As shown here, Indigenous participants dressed in traditional regalia as part of the late summer festival held on the Saskatoon Western Development Museum grounds. Photo courtesy of June Eagle. Although these were spaces constructed under defined and confined conditions and settler colonial surveillance, for the Indigenous participants of these events, these spaces were more complex sites of cultural, social, and political interaction. Whitecap members participating in the tipi villages at the Western Development Museum grounds participated in small scale economic activities, selling pemmican and handicrafts to visitors, and trading amongst themselves. They would meet relatives and socialize, as well as dress in their regalia and dance pow wow with other Indigenous people–activities that were otherwise difficult due to limited mobility and the aforementioned Indian Act controls. This was also a time to teach younger generations about how to construct tipis and the cultural and spiritual teachings underlying the encampments. So while, to the settler public, these encampments indicated the success of the civilizing agenda of settler colonialism, First Nations attendees took Pion-Era as an opportunity for social, economic, and political exchange that would not otherwise have been easily accessible under the controls of the Indian Act. Similarly, for participants, the Justice for Our Stolen Children encampment was an opportunity for cultural gathering and expression. Simply characterizing the gathering as a protest camp flattens its diverse and complex meaning, which allows it to be easily dismissed as “convoluted”. Put another way, defining the gathering as simply a “protest camp” constructed in response to modern settler colonialism positions the camp as a performance for settler consumption, not a call for dialogue with Indigenous peoples. If the camp is seen solely as a protest, and not as a space that is meaningful to participants in many ways, then the implication is that its participants sit outside of the progressive settler public and on the fringes of Indigenous society. While there is no denying that protest was one component of the camp’s agenda, many realities and motivations exist outside of settler interests. A visit to the Justice for Our Stolen Children social media pages indicates that the camp provided a space for cultural expression–one that was constructed by and for Indigenous peoples. Certainly, the aforementioned complex cultural and spiritual associations with tipi encampments make this a deeply meaningful and significant place, as asserted in the recent court hearings. The camp on the Saskatchewan legislature grounds has served as a place of connecting, healing, and learning, with children assisting with camp and ceremonial tasks, and Indigenous health and wellness services on site to emphasize its role as a site of safety and respite in addition to protest. Historical context helps to understand and explain that Indigenous motives behind participating in the camp are not necessarily obstructionist or confrontational. Like the encampments of the pre-reserve era, they are a cultural space to share culture and community. As well, similar to the participation in tipi villages at fairs and festivals, the camp was not simply a performance for settler consumption, but it was also about sharing, maintaining, and even revitalizing their cultural and spiritual meaning. Stephanie Danyluk works for the Whitecap Dakota First Nation, conducting history and policy research in support of treaty and self-government negotiations, as well as community-based research, engagement, and consultation in support of Whitecap’s local history, language, and culture initiatives. Katya MacDonald holds a PhD in History from the University of Saskatchewan. She maintains interests in oral history, ethical and decolonizing research methods, and the arts as historical sources. She is also an enthusiastic proponent of the usefulness of a PhD beyond academia, and currently works in research facilitation and community-engaged project management in universities. Isaac Cowie, The Company of Adventurers: A Narrative of Seven Years in the Service of the Hudson’s Bay Company during 1867-1874, (Lincoln & London, University of Nebraska Press: 1993), 302-307. John L. Tobias, “Canada’s Subjugation of the Plains Cree, 1879-1885,” The Canadian Historical Review, ( University of Toronto Press: Vol 64: 4, December 1983), 525. A First Nations Pow-wow in Yorkton, Saskatchewan, 1908. S-B4015, Saskatchewan Archives Board Photo Collection, Provincial Archives of Saskatchewan, Regina, SK. Whitecap community participating in the Saskatoon Exhibition parade, 1944; photo courtesy of Melvin Littlecrow (pictured second from right). Photo courtesy of Saskatoon Public Library, Local History Room. B-5112, 1959, Hillyard Photographs Collection. Photo courtesy of June Eagle, ca 1955. Marilyn Burgess, “Canadian ‘Range Wars’: Struggles over Indian Cowboys,” Canadian Journal of Communication, 18. No. 3 (1993). Similar historical interactions have been remarked upon by many scholars who have examined Indigenous motives for participating in these events; all look to ways that the Indigenous participants used these events to challenge and resist colonial agendas; See Jonathan Clapperton, ‘‘Naturalizing Race Relations: Conservation, Colonialism, and Spectacle at the Banff Indian Days,’’ Canadian Historical Review, 94 (September 2013), 349–379; Courtney W. Mason, ‘‘The Construction of Banff as a ‘Natural’ Environment: Sporting Festivals, Tourism, and Representations of Aboriginal Peoples,’’ Journal of Sport History, 35 (Summer 2008), 221–39; Mary-Ellen Kelm, ‘‘Riding into Place: Contact Zones, Rodeo, and Hybridity in the Canadian West 1900–1970,’’ Journal of the Canadian Historical Association 18, no. 1 (2007): 107–32; ; Lucy Maddox, ‘‘Politics, Performance and Indian Identity,’’ American Studies International 40, no. 2 (June 2002): 7–37; Laura Peers, Playing Ourselves: Interpreting Native Histories at Historic Reconstructions, (Lanham, md: AltaMira, 2007); Jan Penrose, ‘‘When All the Cowboys are Indian: The Nature of Race in All-Indian Rodeos,’’ Annals of the Association of American Geographers 93, no. 3 (2004): 687– 705. Meijer Drees, L,”Indians’ bygone past:” The Banff Indian Days, 1902?1945,” Past Imperfect: 2, (1993), 7?28. Melvin Littlecrow, interviewed in Whitecap Dakota First Nation by Stephanie Danyluk, May 8, 2014; June Eagle, interviewed by Verna Buffalo, Ken Horseman and Jarita Greyeyes in Regina, SK, April 25, 2012.